Don't worry Thor fans, you'll get a little extra time with your Asgardian prince once the credits roll on Thor: Ragnarok. Which is really just my fancy way of saying yes, Thor 3 has a post-credits scene. According to Forbes' Scott Mendelson, the upcoming MCU film actually has two: one that ties into the plot, and one that's a straight-up joke. 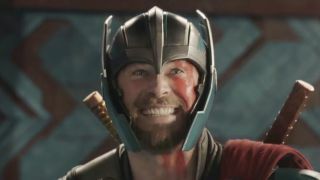 It sounds like Ragnarok is following Spider-Man: Homecoming's example by having the plot-related scene appear partway through the credits while the joke is a send-off saved for the very end. Mendelson couldn't say what the scenes depicted, but he did say what they weren't: a teaser for Avengers: Infinity War. Based on the Infinity War teaser shown at San Diego Comic-Con, we know the god of thunder does bump into the Guardians of the Galaxy at some point in the future, but it doesn't sound like that will be teased in Ragnarok. Black Panther is actually the next scheduled MCU film (set to premiere February 2018) but seeing how Thor has never met T'Challa, I'd be surprised if either scene related to that film. All that being said, it's not unheard of for a movie company to save some of the fun for wider audiences. It's possible there will be more than what Mendelson has reported here when Thor: Ragnarok debuts in a cinema near you. Ever since Robert Downey Jr. tore up the screen as Tony Stark in 2008's Iron Man, Marvel has used the time that used to be reserved solely for a movie's credits to tease future films, give fans a little closure, or just make a funny joke. The trend has become so pervasive that there are now entire websites dedicated solely to answering the question, 'Does <insert movie here> have a post-credits scene?' And now here we are, speculating on not one, but two post-credits stingers. The times they are a-changin'.